Grab your friends and join Dominion Electric Supply and Moss Building & Design for a fun Girls Night DIY, complete with nibbles, wine, raffles and more! 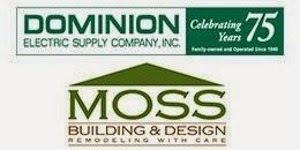 Moss Building & Design will present their Caulk It workshop. This installment of the popular HandyMOM 101 program teaches attendees the ins and outs of proper caulking. Attendees will also have the opportunity to ask questions and seek advice regarding all things home-improvement, as well as peruse Dominion Electric Supply's beautiful lighting showroom! We'll also be raffling off various prizes including a FREE Handyman For A Day (a $700 value) and $100 gift card!